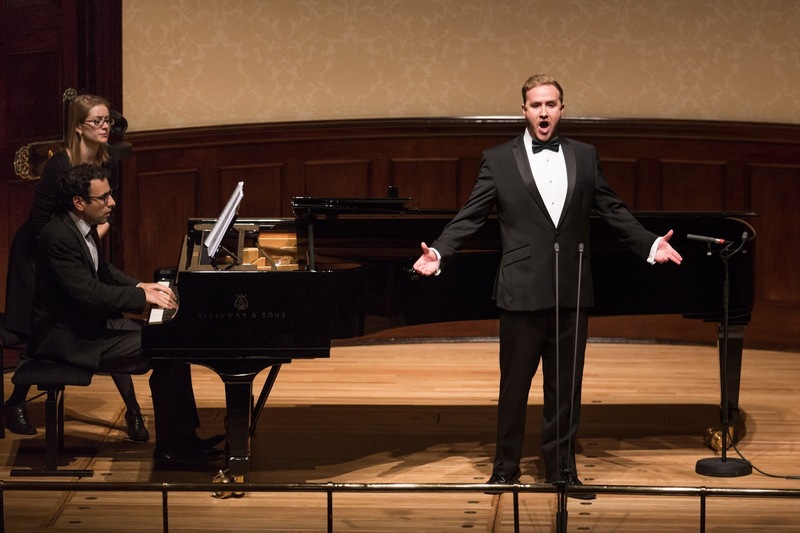 The 2017 Wigmore Hall/Kohn Foundation International Song Competition concluded on Thursday 7 September 2017 with the top prize going to the New Zealand baritone Julien Van Mellaerts (we caught him last year as Schaunard in the Christine Collins Young Artists performance of Puccini's La Boheme at Opera Holland Park, see my review), accompanied by Gamal Khamis. The Pianist’s Prize went to the British pianist Ian Tindale, who had partnered soprano Harriet Burns in earlier rounds, the Jean Meikle Prize for a Duo to British pair Gemma Summerfield (soprano) and Sebastian Wybrew (piano) and the Richard Tauber Prize for best interpretation of Schubert Lieder to American finalist Clara Osowski. Second Prize went to baritone John Brancy, and Third Prize to baritone Josh Quinn. The prizes were all awarded by a jury including Hugh Canning, Bernarda Fink, Christian Gerhaher, Soile Isokoski, David Jackson, Graham Johnson OBE, François Le Roux and Dame Felicity Lott, chaired by Director of Wigmore Hall John Gilhooly OBE. Julien Van Mellaerts has just graduated from the Royal College of Music International Opera School where he was Fishmongers’ Company Scholar studying with Russell Smythe. He recently won first place in the 2017 Kathleen Ferrier Awards at Wigmore Hall and he is currently touring with Diva Opera, playing the role of Dandini in Rossini’s La Cenerentola.